Why I can't just make a pattern as prescribed is beyond me. I've decided to jump on the Clappy bandwagon finally and make one out of laceweight yarn from Handpaintedyarn.com in the Paris Night colorway. Of course, the pattern calls for worsted (Lorna's Laces Lion and Lamb), but I thought laceweight would make something more delicate and shawl-like. So, I spent a lot of time googling laceweight Clapotis and Handpaintedyarn laceweight, ended up joining a Clapotis Yahoo! Knitalong group, and generally became obsessive. Though not as obsessive as some folks are about Clapotis. Just type that word into your favorite search engine and you will find all sorts of links to people reworking the pattern and getting obsessive about using stitch markers (the pattern calls for 18 - 18!) or purling the stitches that will be dropped later. Anyway, I've cast on twice. First time with US8, which didn't go too well, then with US6, which went better, but I seem to have lost a stitch somewhere, so I think I'm going to have to frog it and start again. Third time's the charm, right? Right. Is it wise to have two laceweight projects on the needles at the same time? Probably not, but that's where I am. There will be a future post about the other laceweight project, which I will probably knit forever since I want a knee-length cardigan. Barking mad, I tell you. But back to the Clapotis. I think it will come out nicely once I get started properly. I will need to get some more stitch markers, but that's fine. They're inexpensive, and something you can sort of never have enough of, since they tend to disappear into the cushions. The yarn is really nice. Lovely shades of grey. It's the regular wool laceweight as opposed to the Merino, since they had very few color choices in Merino when I placed my order. (Full disclosure: I did buy a skein of black merino - very soft - but I'm not sure what I'm going to do with it.) So, Paris Night. It's dark grey with shots of light grey every so often. I should probably knit up a gauge swatch to show it off. Especially since I searched obsessively for info and images of the yarn online before buying it in part due to Handpaintedyarn.com's somewhat primitive website, but mostly due to buying yarn without touching it. They are the folks who bring us Malabrigo in shops, so I knew I would be pretty happy with the yarn, but there is always a little trepidation. In my searches I ended up checking out the forum on Knitter's Review, which had a whole thread on Handpaintedyarn.com, and the Coffeeshop on Knitty, which, of course, has a whole section of threads on Clapotis that led me to the Yahoo! group. Oy. 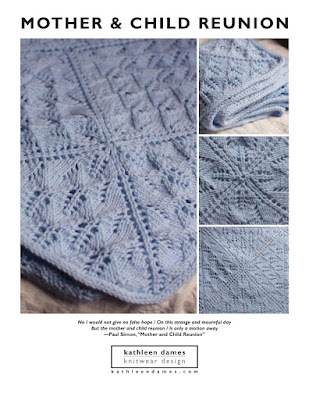 Lots of great resources online for the obsessive knitter. While searching for all the Handpaintedyarn information I could find, I noticed a dearth of information on their boucle, making it difficult for me to commit to buying some, though it looked so yummy in the Natural colorway on their site. Sort of like the natural color Lumpy Bumpy I've been mooning over at my LYS. I ended up taking the plunge and think the yarn is quite nice. I'll write about that in a future post. Oh, the other thing about altering the pattern is that I've been wondering about Bob + Weave-ing the finished Clapotis with some pretty ribbon woven through the ladders. Can't tell if that would be too much, but I originally thought of making B + W before going laceweight crazy. Then I had trouble figuring out a yarn substitution for the Artfibers called for in B+W, since they don't seem to make the yarns called for anymore. Plus their site is very annoying to navigate, and they don't seem to have distribution. And that just led me off on the current path.